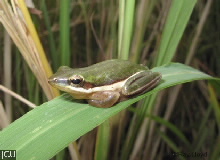 This small frog, commonly green and usually with a bronze stripe along the back, likes to sit in the axils of Pandanus leaves and on the upper surface of broad leaves. The upper lip is bordered by a narrow white line, undersurface varies from white to pale yellow to cream. Fingers have a trace of webbing but toes are webbed for up to three-quarters of their length.